In this month’s posts we would like to publish some interesting documents about Houdini’s visits in Eastern Europe, specifically to Vienna and Prague. Harry Houdini was scheduled to perform the first time in Vienna in November, 1900. He was contracted by Mr. Waldmann, Director of the Ronacher Theater. 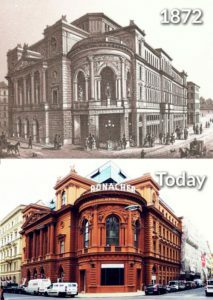 Etablissement Ronacher (as it was called at that time) was the No.1 varieté theater in Vienna at the turn of the century. Interestingly enough, the director, Lajos M. Waldmann, was a Hungarian man. His son, Imre Waldmann, was the director of the Budapest Orpheum. Houdini’s debut in Vienna was scheduled for November 1, 1900. At the end of October 1900 newspapers in Vienna started to advertise Houdini’s debut. 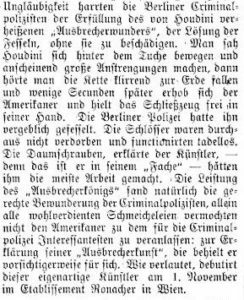 The following article was taken from Wienerwald Bote, October 28, 1900. It gives a short overview of Houdini’s life and his amazing tricks in Berlin. The final sentence announces that he will perform at the Ronacher Theater starting on November 1. The next day, unfortunately, brings the bad news: Houdini broke his contract and did not come to Vienna. The reason: he received such a challenge in Berlin that he could not resist and had to extend his stay in Berlin for a few more days. Not doing so would have meant losing his reputation as the „Handcuff King”! 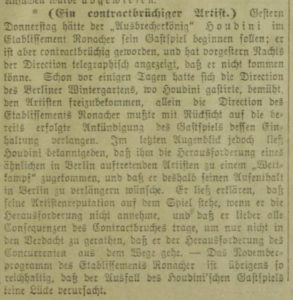 Article from Neues Wiener Tagblatt, November 2, 1900. Today and every day: Harry Houdini. The Handcuff King! 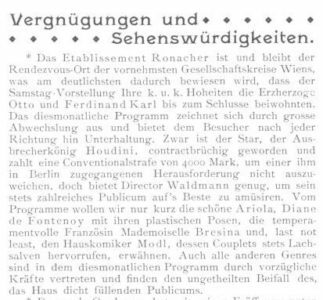 Although Houdini was clearly not present in Vienna, Ronacher still used his name to pull in the audience to watch the November show. The advertisement also appeared on November 6, 8 and 13. More about his Prague visit in our next post! Very interesting. Thank you. I take it there will be a Part 2 covering his 1902 appearance? Looking forward to it.